"Astronomical Accessory - a supplementary component that improves capability;"
Sherwoods stocks a vast array of add on & after market accessories for most astronomical telescopes on the market today. From eyepieces to motors, cables to cleaning kits. 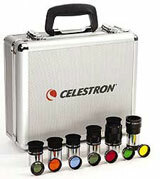 We have all the astronomical telescope accessories you need to improve the capability. Skywatcher is a First Class, Market leading telescope brand offering and incredible range of high quality astronomical accessories. Most of the accessories in the range can be readily interchanged with other makes allowing upgrades and additions to your scope to be made easily. This kit of five Superior Grade Plössl Eyepieces, barlow Lens and seven coloured eyepieces filters (for Lunar & Planets) is a must have for anyone wish to add to or upgrade the supplied accessories. It is supplied complete is a quality foam lined aluminium carrying case.